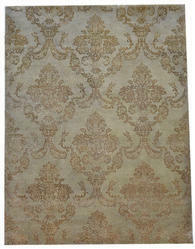 Description:Smartly crafted Indian silk carpets will beyond doubt prove a style statement to your room. Unforgettable gifts for flower lovers. Known for their softness along with fine workmanship, our range of Ivory Silk Carpets is available in finest designs and patterns. Our range is manufactured using natural silk & 100% NZ wool.These carpets are available in beautiful ivory color to decorate the interiors. We also provide carpets as per the clients specifications/requirements. 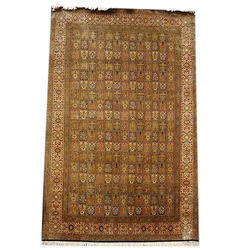 We offer best quality silk fiber in different colors is imbibed by us to offer a wide range of Indian Silk Rug. Both hand crafted and machine made rugs can be availed from us at best of industry rates. It is a Coloured Silk Carpet. In this carpet, there are lots of flowers. These Flowers are hand crafted very sharply and carefully. This flower gives you a natural feeling in your home. In this carpet, all colours are natural.